If you are a Halo fan, and who isn't, you are probably doing thumb presses and finger stretches in preparation of some marathon gaming when Halo 3 releases in a few days time! Heck, even Buzz Out Loud's Molly Wood says this is the game that makes her want to by an Xbox 360. 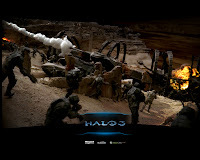 Well if you're dying for a Halo fix check out the virtual fly through. Move around in the 3D space, click hot spots and take awesome screen shots of your favorite scene. It will keep the edge off until the game releases! Besides being an online retailer, Amazon.com is in the hosting business offering storage, virtual server, payment and other services on a pay-per-usage basis. Some customer are saying that using Amazon Web Services has allowed them to skip venture capital funding because they didn't have to invest in hardware infrastructure. Amazon is now trying to get the word out by launching a Start-up Challenge that will see the best new Internet company idea receive funding in the form of $50,000 cash, an equal amount in Amazon Web Services credits, mentoring and a "seed investment offer,". Successful start-ups such has Justin.tv have gone the route of Amazon Web Services and the service is seen by many as a viable alternative to costly capital investments. Time to put the thinking caps on! When you have your sights set on putting astronauts on the moon or the red planet, you have to get creative and get stingy. NASA scientists, looking for ways to conserve and re-use are experimenting with "technology that would allow astronauts to convert both sweat and urine into drinkable water." Twenty employees of Marshall Space Flight Center in Huntsville, Ala., will be sweating up a storm exercising, to generate water vapour through perspiration and respiration and donating urine as part of the test. The hope is that the hard work will allow NASA to conduct long space missions without need for resupply. All I can say about this one is, as cool as it sounds being an astronaut, this one would be the deal breaker for me! CBC story here. Bootstrapper's Laura Milligan has compiled a list of the 100 best foods to make you more productive. I've only just viewed the list so I can't attest to it's effectiveness and with eggplant, raisins, and lima bean making the top three I'm not sure whether or not I'm game to try. Need a little boost? This might just be what the doctor ordered! PC Magazine's Tim Gideon provides a round up of the iPod Touch's features and it's evident that he's a fan. Gideon says "This is probably the best portable media player ever made." If you are contemplating a purchase this is a decent in depth look at the features including photos of the interface / screens. It's one man's opinion, but it's obvious that the new device has some great features. Google has offered up a total of $30 million in prizes for private firms to land an unmanned rover on the moon. The contest, Google Lunar X Prize, being run through the X Prize Foundation gives interested parties until the end of 2012 to land their robotic rover on the moon. The fun doesn't end there however, there will be tasks to perform such as traveling specific distances and shooting video footage. The first company to achieve the goals will win $20 million, $5 million goes to second place, and bonuses of $5 million will be awarded for extra achievements. The BBC has the complete story. MySpace has announced an exclusive deal with Hollywood producers Ed Zwick and Marshall Herskovitz, for the rights to a new Internet drama they are working on, called Quarterlife. Under the terms of the deal MySpace has a 24-hour window during which the webisode will only be available on MySpaceTV. It will then appear on Quarterlife.com. Viewers will be able to interact with the cast members through their MySpace pages. Zwick and Herskovitz are best known for their television shows Thirtysomething and My So-Called Life and MySpace officials are saying the show will offer “the highest-quality serialized content ever to appear on the Internet. We're talking about the same production values as 24 or Prison Break.” The Globe and Mail has more. Maybe I'm reading more into this post than is intended... but it sounds like the folks at Gizmodo may have some inside info with regards to an iPhone firmware update and the probability that it will undo your unlock! It will be interesting to see what transpires. p.s. it's worth following the link just to see the Darth Vader pic. Belkin announced on Monday that it will donate $2.50 from the sale of every “Hope” protective case for the iPod nano. A gaurenteed minimum donation of $225,000 is pledged to Susan G. Komen for the Cure. Belkin's press release here. Yesterday morning, NASA engineers sent commands to the Mars rover Opportunity to begin its trek into Victoria Crater, and the robot signaled a confirmation. The first step is for the rover to gingerly maneuver below the rim of the crater and then quickly roll back out. The hope is that Opportunity will be able to travel 40 feet down the crater toward a bright band of rocks that scientists believe represent the ancient surface of the planet. CNN has more here. With one "Critical" patch and three "Important" ones, this months updates from Microsoft is the quietest of the year, and no reported Skype outages to my knowledge! The critical patch affects users of Windows 2000 operating system, with the vulnerability triggered by a visit to a website and the install of software that could then infect the computer with a malicious virus. Perhaps things are tightening up for Vista and XP? Or are the hackers just not back from vacation yet... Time will tell. Which magazine's covers do I have hanging on my wall? The UK employment law firm Peninsula estimates 233 million hours are lost every month as a result of employees, that equates to approximately £130million a day in lost productivity! "The figures that we have calculated are minimums and it's a problem that I foresee will escalate," say Mike Huss director of employment law at the firm. "If a company can police the system, and only allow limited access during lunch breaks then that is fine. However I think it would be easier and less expensive to ban access altogether," he said. He's got a point! Why are we drawn to someone else's embaracing moments? New Zealand government computers have been the most recent target according the countries top intelligence officer and confirmed by the Prime Minister. Security Intelligence Service head Warren Tucker said “strong evidence” was found to link the hacking activities to foreign governments and referred to comments by Canada's security service about Chinese spying activities. Prime Minister Helen Clark said she knew which government was responsible but declined to name names. The Globe and Mail has more here. Defence firm Qinetiq said Monday that a plane that they developed reached an altitude of close to 18,000 metres on the 54-hour unmanned flight. The company says the plane, called Zephyr, could be used either for Earth observation or as a relay for defence, security or civil communications. The plane may not get the official record with the 54 hour flight because the Fédération Aéronautique Internationale had not been notified and was not present during the test but a second test that lasted nearly 34 hours did meet the record breaking requirements and pushed the mark by a little over 3 hours. Well the wait is nearly over according to Gizmodo! The egg shaped Sony Rolly is said to be released on September 29th in Japan. The egg-shaped dancing MP3 player is motion-controlled, having sensors that know which way is up. Volume is controlled by turning the player clockwise or counter clockwise, and you can skip or repeat tracks by rolling the player forwards, backwards, or shaking it. Dance moves can be downloaded to the Rolly or you can create your own with the available software on your computer. The price is reported to be $351. It's interesting but is it $350 interesting? We'll see! More photos and video on Gizmodo. Photo Violation Technologies of Vancouver has partnered with IBM for a $1 million trial of a new parking meter that allows you to pay via your credit card, calls your cell phone when your time is up allowing you to top up your minutes, and snaps a picture of your license if you fail to pay... good news for municipalities and drivers who are inclined to pay. Those who typically take their chances are not going to like it! I've added a new poll section, simply scroll down the page it's located on the right just above my profile. I'll add a new poll question every week. This week's poll: which new iPod are you craving?